Spring recipes: Healthy and tasty selections. Place the almonds in a dry skillet or sauté pan. Cook over low heat, shaking the pan the entire time until the almonds are toasting. Almonds are done when you start to smell a “nutty” scent. Remove almonds from the pan to cool. (Do not cool in the skillet because they will burn from the heat that remains in the pan.) Wash and dry the spinach. Prepare the dressing by placing the vinegar, mustard, and honey in a mixing bowl. Slowly whisk in the oil until all is incorporated. Place spinach in a large bowl. 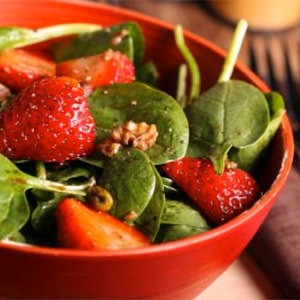 Add strawberries, almonds, and dressing. Toss to coat. If desired, season with a pinch of salt and pepper. Minutes to Prepare: 10 min. Minutes to Cook: 15 min. 1. From lemon, grate 1 tablespoon peel and squeeze 3 tablespoons juice. In medium bowl, whisk together lemon peel and juice, oil, salt, and pepper; transfer 2 tablespoons to cup. 2. Add chicken thighs to bowl with lemon-juice marinade; cover and let stand 15 minutes at room temperature or 30 minutes in the refrigerator. 3. Meanwhile, prepare charcoal fire or preheat gas grill for covered direct grilling over medium heat. 4. Discard chicken marinade. Place chicken and squash on hot grill rack. Cover grill and cook chicken and squash 10 to 12 minutes or until juices run clear when thickest part of thigh is pierced with tip of knife and squash is tender and browned, turning chicken and squash over once and removing pieces as they are done. 5. Transfer chicken and squash to cutting board. 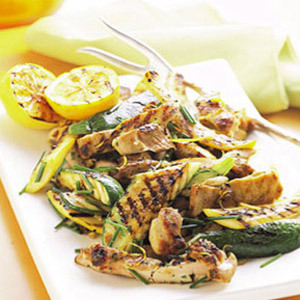 Cut chicken into 1-inch-wide strips; cut each squash wedge crosswise in half. 6. To serve, on large platter, toss squash with reserved lemon-juice marinade, then toss with chicken and sprinkle with chives. Garnish with grilled lemon slices.